When the 15,000 plus runners sprang from the starting line at the recent 2015 Air Force Marathon and related races, 65 ham radio operators were on duty to make sure the September 19 competition was as safe as possible. Held each year at Wright Patterson Air Force Base near Dayton, Ohio, the Marathon uses base roadways as well as streets in Fairborn and Riverside. Hams are positioned at critical points throughout the courses, not only to provide communication, but to serve as additional eyes and ears, watching for any signs of problems. Hams have been a part of the race since the first official marathon was held in 1997. “This race would be extremely difficult, if not impossible, to accomplish without their support and dedication,” USAF Marathon Director Robert Aguiar said of the Amateur Radio volunteers. He said hearing the ham radio net on the morning of the race makes his stress level goes down. Amateur Radio communicates information on runners’ locations and status, heat index, severe weather, medical issues, and logistics, and the volunteers use APRS to track lead, “tail-end charlies,” and selected runners. This allows race officials and emergency services to have a more accurate picture. Many medical issues were reported, but most involved blisters, dehydration, and cramps; only two runners required transport to a medical facility. 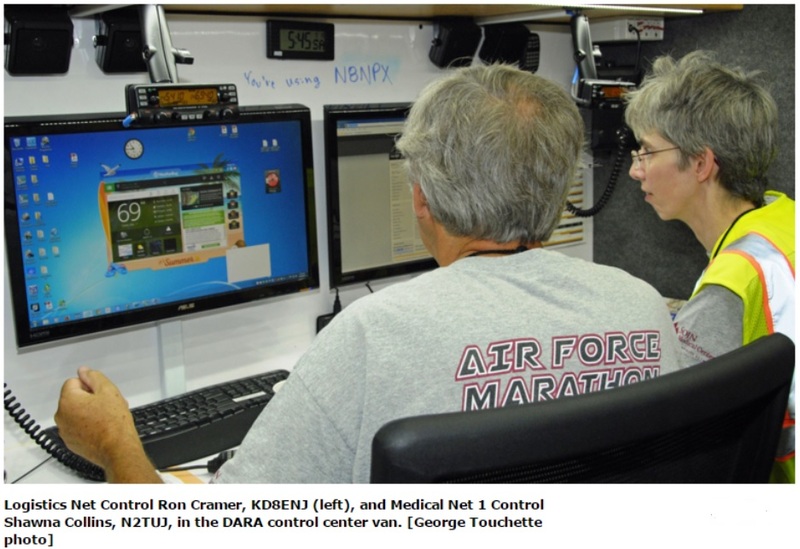 Both the Dayton Amateur Radio Association (DARA) communication van and the Xenia Weather Amateur Radio Network (XWARN) communication trailer were utilized. Hams this year were part of a test on a developing medical and race security management system that used a large command and control trailer linked by microwave to other trailers along the course. Those testing the system took Amateur Radio’s APRS information from the internet and displayed it on their command and control maps. The outlying trailers had remote-controlled cameras that could survey most of the course. Crawford reported that Amateur Radio was still faster in passing messages in most instances. The base fire department also requested ham radio support in their station control center. That included APRS tracking, monitoring of all nets, and installation of antennas, cabling, and radios. 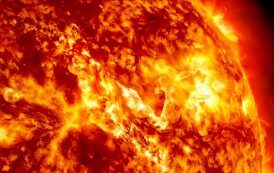 Permanent installation of Amateur Radio equipment is under consideration.